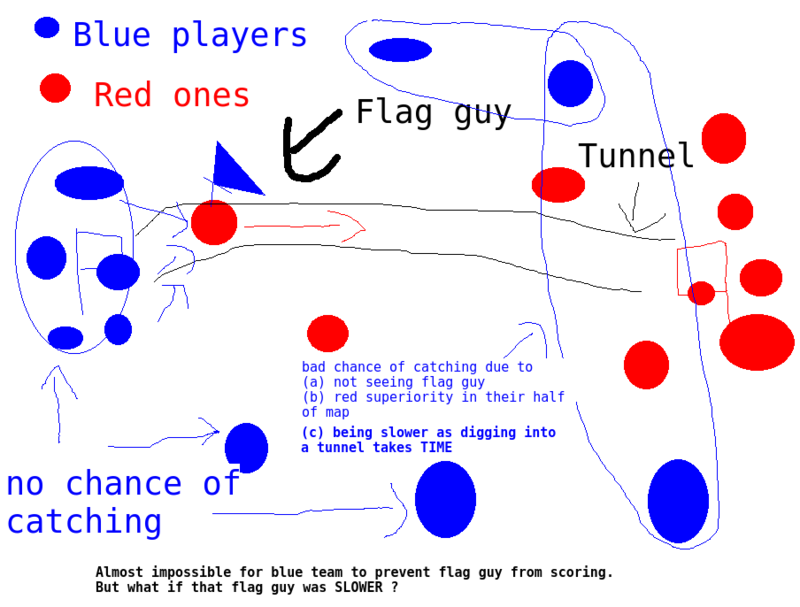 Re: Short Proposition on how to eliminate flag-tunneling. Stix wrote: Short Proposition on how to eliminate flag-tunneling. Anyone who's played on CTF for a reasonable amount of time knows that tunneling to grab the flag is a big issue and looked down upon, so i propose a way to eliminate it. My idea is simple: to eliminate flag-tunneling we must remove players ability to tunnel. How do we do that? All it would take would be to make stone generated in the map indestructible in a 20-block radius around the flag for non-members. That way players tunnel would have to stop at a distance from the flag, and they then have to actually risk themselves to achieve their goal. @All id love to hear what you think of this, don't forget to write a reply! There are a lot of risks to tunneling. If someone follows and kills you (Which isn't hard to do) The enemy then have a tunnel to get to your base. In the Caverns map I made a tunnel to the enemy base. And Waterbug found it. He was able to win the match because we were unable to fend him off. So my tunnel was used against us. These are all aspects of the game you're talking about - it's just part of the game-play. There's nothing wrong with it. Yes, annoying things will happen such as tunneling, people building straight up, people spamming apples faster then you can damage them, getting killed, getting grenades thrown at you, etc. You start taking stuff like this away, you start taking the game away. There are a lot of risks to tunneling. If someone follows and kills you (Which isn't hard to do) The enemy then have a tunnel to get to your base. Not true. There is no way to detect an incoming tunneler, nor the direction. Meaning that once they have your flag you'll have to go through hell to get it back, as they'll block off the tunnel behind them and the end of their tunnel ends smack-dab in enemy territory. So no matter how many players you kill in an effort to get the guy with your flag, newly re-spawned players will come to take their place, meaning even a large force can get overrun. Lone_Wolf wrote: In the Caverns map I made a tunnel to the enemy base. And Waterbug found it. He was able to win the match because we were unable to fend him off. So my tunnel was used against us. The only way to find a incoming tunnel is pure luck or its owner was being sloppy. Even the best fortifications are useless against tunneling, let me give you an example: Our base was surrounded by a perimeter wall made of wood. this wall was 10 blocks high and 4 blocks thick, and supported at the back by cobble. Underneath our flag room the area was hollowed out to stop ppl tunneling beneath us, all the jungle-trees in the surrounding area was cleared out, and we had a couple players guarding the base/battlements. Despite all this a player was able to tunnel underneath it all and grab our flag. You want to know why? Because we couldn't be everywhere at once and we had no way to tell what direction they were coming from, or even that they were tunneling to us! Last edited by Stix on Fri Jul 20, 2018 15:46, edited 1 time in total. DragonsVolcanoDance wrote: These are all aspects of the game you're talking about - it's just part of the game-play. There's nothing wrong with it. Yes, annoying things will happen such as tunneling, people building straight up, people spamming apples faster then you can damage them, getting killed, getting grenades thrown at you, etc. Personally i have nothing against flag tunneling itself, but rather the fact that it's so OP. If it was somehow de-buffed I (and probably others) would have no problem with it. And you can also do f7 in a 2x1 tunnel and jump repeatedly to see in noclip view. And to your example: Sounds like he could have walked in from behind and took it too. Srry, but i have to actually defend the base sometimes, i can't just use the well-known 3rd-person glitch all day (yes ive tried detecting tunnelers using that trick before). Wow that sounds rlly cheaty, that glitch rlly needs to be fixed. At least the 3rd-person glitch only enabled you to see tunnels (also its a pain to use). You can design maps wherein it is very hard or impossible to use the tunnel tactic if you find this tactic particularly annoying (and it is kind of annoying). rubenwardy is right; it is technically a valid tactic. By the way, I've foiled players many times when they tried to use the tunnel tactic against my team. If you dig moat around the base, it will help a lot against (underneath) tonneling tactic. It is not very usable in Cave map since ppl can tonnel above base. Xudo wrote: If you dig moat around the base, it will help a lot against (underneath) tonneling tactic. It is not very usable in Cave map since ppl can tonnel above base. @rubenwardy i've fixed the scaling issues with my rankings proposition if your interested. This way you have to actually be able to frequently kill enemy pros, instead of relying solely on kill-amount alone. Besides fixing the scaling issues this also partially solves spawnkilling, as spawnkillers are locked out of higher ranks, and potentionally the pro chest. Therefore forcing players to either stop spawnkilling or risk being greatly disadvantaged. My idea to improve team-picking is to divide players based on rankings. Now before you reply hear me out: i'm not referring to the default ranking system (which is really just a score-board), but rather a new one that resembles badges (ranks could be like "newbie", "pro", "veteran", "overlord" ect). How this would work is killing gives you EXP, more-specifically killing a player below your rank gives you 1 EXP, killing a player at your rank gives you 2 EXP, and killing someone directly above your rank gives 4 EXP, with 1 EXP added on top for each rank above that. Too level up a rank players need to gain a set amount EXP, alongside having a positive K/D ratio. The total EXP gained in a match is decreased by 10% if your team lost. When in-game, ranking tags will be used for players to easily identify a players skill lvl from a distance. Another idea to go on top is that the server checks if the matches are fair every 1 minute and if they're not, swaps a player to a different team accordingly with a msg: "Player XYZ has swapped teams!". 1. Players skill-level can be determined from a distance. 2. Matches will be much more fair. 3. Suicidal players are locked out from ranking up. 4. Adds more of an incentive to win. 5. Adds more of an incentive to fighting (non-contributing players will be left in the dust). 1. Skilled players joining for the first time can put off match balance as the server sees them as a noob. reliably kill the players of, therefore lvl'ing up faster. b. Adding an incentive to have a higher rank besides bragging rights, maybe some kind of reward. @All anyways id like to see what you guys think of this (especially @Rubenwardy and @ANAND). About as easy as it could get. I guess I don't have to explain how this solves problems as tunneling ? Weird, from my experience in games when they have multiple classes most players (including me) set it as a goal to reach the top, meaning they are inspired to get better. And you must admit such a system would greatly improve team fairness. BTW: I'm glad you've stopped being a genius long enough to reply on the forums :P.
Last edited by Stix on Tue Jul 24, 2018 14:35, edited 2 times in total. NO NO No No no no! If you say no, explain why. Warning ! This may hurt your eyes. No! CTF is a fast-paced game, we should use different methods to fix this, such as this one i suggested earlier. *EDIT: Also it is possible to catch them off-guard at their base, or grab their flag too, but that is often very difficult/suicidal. I agree, the rankings is supposed to be a scoreboard. I now have video proof geesh is cheating, i just need somewhere to upload it now. Stix wrote: I now have video proof geesh is cheating, i just need somewhere to upload it now. How was he cheating? I'd like to know.